The Royals’ minor league system has been vaunted as one of the best stockpiles of young talent in baseball history. Last season Eric Hosmer, Mike Moustakas, Salvador Perez, Johnny Giavotella, Danny Duffy, Aaron Crow, Tim Collins, Louis Coleman were all a part of the system’s “first wave of talent” to make their way to Kauffman Stadium. 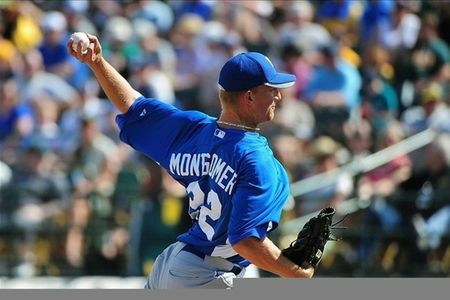 But even though most of the system’s more notable names have gone on to play in bigger and better games, the Royals still boast one of the league’s top farm systems (Baseball America no.2, Keith Law no.5, Baseball Prospectus no.5, John Sickels no.6) with names like Bubba Starling, Wil Myers, Mike Montgomery, Jake Odorizzi, Cheslor Cuthbert, John Lamb, Christian Colon, and Jason Adam. Well on Wednesday night, another Royals farm-hand made his major league debut. Left-handed starter Will Smith got the call from Omaha to make his first career start againt the Yankees. In New York. Needless to say, his first big league appearance didn’t go as well as he had wished. He only lasted 3.1 innings while giving up 5 earned runs on 6 hits (3 homeruns). With the call-up of Will Smith from Omaha to KC and the recent promotions of Wil Myers and Jake Odorizzi from Northwest Arkansas to Omaha, the “second wave of talent” could be making its way to Kansas City sometime soon. Monty’s struggles at the Triple-A level have been well documented. He was 5-11 last season in Omaha with a 5+ ERA and is 2-1 with a 4.38 ERA thus far in 2012. His walk rates are way up (4.2 BB/9) and is averaging less than 6 innings per outing. But there are many reasons why he’s been ranked in Baseball America’s Top 50 Prospects three years running (2010 – no.39, 2011 – no.19, 2012 – no.23). Mike is a tall, powerful lefty with the ability to throw three plus pitches. Keep in mind, he’s only 22 years old and is pitching in his second season in the Pacific Coast League (a notorious hitter’s league). If Mike can turnout solid, consistent outings, he could soon force his way into the big league rotation. Barring an injury or a trade, I don’t think we see Monty until after the All-Star break. Wil Myers has been absolutely tearing up minor league pitching this season. In 35 games at the Double-A level, he hit a ridiculous .343/.414/.731 with 25 of his 46 hits going for extra bases (11 2B, 1 3B, 13 HR). He scored 32 runs, drove in 30, and even managed to swipe 4 bases while logging time in RF, CF, and even 3B. He’s continued his swing since being promoted to Triple-A Omaha to the tune of .314/.385/.657 with 5 XBH (1 2B, 1 3B, 3 HR), 6 RBI, and 5 runs scored. The Royals have been moving Wil around the field essentially to get his bat to Kansas City as quickly as possible. But in he end, he’ll most likely stick somewhere in the outfield. Now even though Jeff Francoeur is riding a hot streak right now, his time in Kansas City could be close to expiring. It’s not his fault really. One of the game’s top outfield prospects is waiting in the wings and is doing everything he can to get to Kansas City as soon as possible. Of all of the names on this list, Jake Odorizzi most likely will be the first to get the big league call. The right-hander has a fastball that can touch 95 mph, but usually works more efficiently at 90-94 mph. He also possesses an above average curveball and changeup. His slider is still developing, but his first three pitches alone should be enough to translate unto big league success. In 9 combined starts between Double-A and Triple-A, Izzy is 5-2 with a solid 3.20 ERA. He also is averaging a spectacular 10.2 K/9 while only allowing an average of 2.0 BB/9. Jake is compared to Zack Greinke by scouts, given their simliar frame (6’2″, 185 lbs), smooth delivery, and strong command of the strike zone. However, scouts do differ when it comes to projecting Izzy’s future role in the big league rotation. Some say he’s a future ace (ahead of Mike Montgomery), while other’s see him more as a no. 2 or no. 3 guy. Given the Royals’ rotation struggles this season, with both health and consitency, Odorizzi looks primed for a big league promotion sometime before September. Duggy is already a member of the Royals’ 40-man roster, so promoting him to the big leagues wouldn;t require removing anyone from the 40-man. This fact alone makes him primed for a 2012 call-up. After coming over to Kansas City via the Melky Cabrera-Jonathan Sanchez trade, Verdugo has been pitching at Triple-A Omaha exclusively as a starter (he had started only 1 game before 2011 when he started 25 games in Double-A). So far, he’s been impressive. He has a 3-1 record with a 3.61 ERA. He’s always had great strikeout numbers (career: 10.4 K/9, 2012: 7.2 K/9), but his walk rate is a little discouraging (career: 4.5 BB/9, 2012: 4.4 BB/9). He’s averaging nearly 6 innings per start this season and has a solid WHIP of 1.186. The 24-year-old has an aggressive approach and goes right after hitters. His fastball is a tick above average, occasionally plus. His breaking ball, a slider, is Major League average, but he uses it well. He throws an average changeup, too. Verdugo gives the Royals organizational depth and flexibility given the fact that he’s logged considerable time in the ‘pen (75 relief appearances, 13-1 record, 2.64 ERA, 13.4 K/9) and as a starter (36 starts, 11-7 record, 4.13 ERA, 8.6 K/9). If Verdugo is brought up to Kansas City at some point in 2012, he would likely fill the same role as Everett Teaford – a lefty that can pitch multiple innings out of the bullpen as well as start games as needed. Great review of minor league Royals, who are on the verge of making the major league team.